Virtuoso bass guitarist, improviser and composer Giacomo Merega has been one of the most original figures in the New York improv/new music scene for over a decade, after completing his studies in Boston at Berklee and at the New England Conservatory. Giacomo’s recordings as a leader and/or sideman have been written about and aired on radios in a dozen different countries, and some have won critical awards in the US, Italy, France and Canada. His works have been recorded by Hat Hut (one of the most iconic labels devoted to avant-garde music), Not Two, American Clave, Underwolf and Rudi Records. 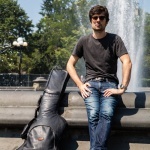 Giacomo has performed and presented masterclasses extensively in the US, Europe and Asia and his long list of collaborators includes acclaimed musicians such as Joe Morris, Anthony Coleman, Steve Swallow, Kip Hanrahan, Nate Wooley, Tyshawn Sorey, David Tronzo, Brandon Ross, Satoshi Takeishi and Mat Maneri among many others. Born March 29, 1955 in Kokubunji, Tokyo. Junji Hirose is one of the most unique artists on the Japanese free improvised music scene. Since the eighties he has developed highly diverse and creative sound, playing tenor and soprano sax and the self-made "noise machine." Hirose started listening to modern jazz in junior high when he especially liked trumpeters such as Miles Davis and Terumasa Hino. He bought a trumpet and taught himself to play. Having listened to records by Davis's band for some time, he became very interested in John Coltrane, who was in that band. At this time he bought a tenor sax and started to teach himself to play. (He also started to play soprano sax around 1977). Hirose enrolled in Meiji Gakuin University in 1973 and soon joined the student modern jazz club. While he was still a student, a soul group invited him to play in a recording, which came out and became Hirose's record debut. Also as a student, he happened to hear the album Pakistani Pomade, by pianist Alex Schlippenbach's trio, with Evan Parker (sax) and Paul Lovens (drums). This was Hirose's first encounter with European free improvisation, and the music--Parker's in particular--had a strong impact on him, and greatly influenced his musical style. About a year after his graduation in 1978, Hirose began to collaborate more with other musicians. In 1979 he formed the free improvisation trio Free Expansion, with Shuichi Nagano (bass) and Yasuhiro Yamazaki (drums). It was around that time that he got to know Masahiko Kono (trombone) and they began holding concerts together. Hirose also occasionally participated in workshops organized by artists like Toshinori Kondo (trumpet), the late Motoharu Yoshizawa (bass), and Mototeru Takagi (tenor sax), where he played with non-Japanese musicians like Eugene Chadbourne (guitar) and Paul Lovens. Artists with whom Hirose played often in the early 1980s included the late Akira Iijima (guitar), Yoshinori Motoki (guitar), and Yoshisaburo Toyozumi (drums). These gigs were held mainly at the club Far Out in Atsugi, and the performance space Terpsichore in Nakano, Tokyo. At Terpsichore, he organized concerts with a variety of artists--musicians, dancers, poets, etc. Hirose released his first solo album, Solo Saxophone, in 1981. When the EastAsia Orchestra was formed in 1982 by Yoshiaki Fujikawa (tenor sax), Hirose was invited to join the group on sax. He left the band soon thereafter, but rejoined them in 1984 for a brief period, during which they toured West and East Germany, Holland, Switzerland, and Austria. This was Hirose's first experience performing outside Japan. In the same year, he joined percussionist Masahiko Togashi's band as a sax player and had played with Togashi in various settings--duo, trios, quartets, orchestras, etc.--until Togashi's death. In a number on the 1981 album Hodgepodge, Hirose used the electric guitar as a "noise machine." After that, he began to develop his original self-made instrument for "noise sound." At first, he simply placed a lot of junk items and toys around him and made sounds on them, but in the mid-1980s he put them together in a frame. In 1987, when he was to perform at a jazz festival in Leipzig, East Germany, Hirose made the instrument smaller so he could carry it more easily, and found this version to be better than the larger one. Thus it became the prototype for his current noise machine. In the late 1980s, Hirose played this instrument much more than he played the sax. At about that time he met Otomo Yoshihide (turntables and guitar) and starting in 1988 played duos with him over a period of several years. In 1989 they made the duo album Silanganan Ingay. While Hirose used mainly the noise machine in duo concerts, he joined Otomo's band Ground-Zero as a sax player. In 1991 he was a guest performer with the band, and in 1992-93 he was a regular member. He also played sax in Ground-Zero's final concert in Tokyo in 1998. In 1989, Bassist Daisuke Fuwa formed the orchestra Shibusashirazu, which incorporates jazz, dance, theatre, and art, and since then Hirose has occasionally played sax with the group. He was also a member of drummer Masahiro Uemura's avant rock/jazz band P.O.N. for the entire duration of its existence (1991 to 1999). Around the mid-1990s, he joined video artist Hideaki Sasaki's trio project Stereodrome with Uchihashi Kazuhisa Uchihashi (guitar and effects). Hirose performed at the Moers Jazz Festival in 1993 and 1998, as a member of Ground-Zero and Shibusashirazu orchestra respectively. Ryutaro Endo is a guitarist based in Tokyo. After studying Photography and Art, he transitioned his creative expression into music. While being part of the Tokyo Avant-garde and improvised music scene, Endo keeps his music rooted in traditional styles such as Jazz and Blues and performs diversely with various musicians. His solos, on the other hand, use fundamental guitar tones which balance the explorations of the familiar and the unknown.To our mind, Ryutaro's guitar playing evokes traces of early Taku Sugimoto and Jim O'Rourke alongside a slowly shifting melodic sensibility almost akin to the more tattered ends of minimalism.